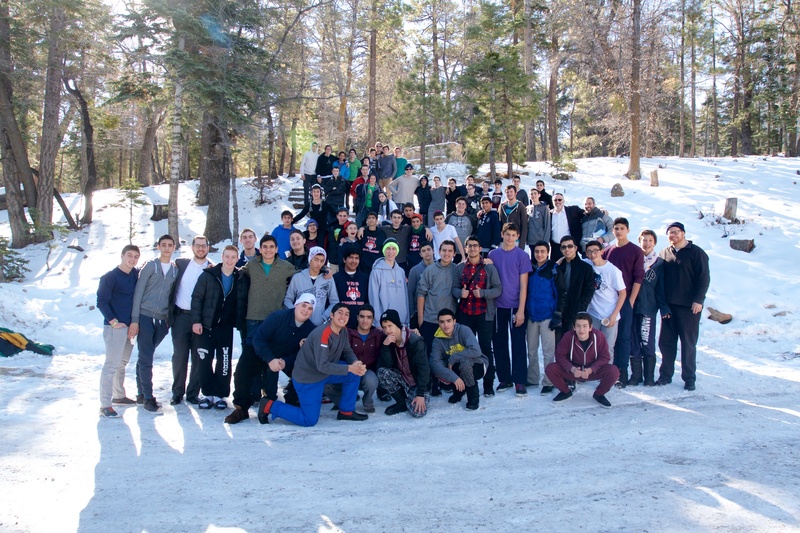 We just returned from one of the best Shabbatonim ever! The chain restriction up to Angelus Oaks were just lifted as we left for the Shabbaton. We arrived as the temperature dipped to 21 degrees at the Winter Wonderland where we would stay for Shabbos. Before bed, the boys topped off the evening with a hot dog cookout, tobogganing and football in the snow. Half the group woke before dawn to daven and leave for skiing at Snow Summit. The second group got to sleep late (6:30) and left for tubing in Big Bear. They returned to enjoy the snow and prepare for Shabbos. Singing & dancing at Kabbolas Shabbos; wonderfully tasty food; divrei Torah by the students & rebbeim; time spent with friends. If you want to really know what Shabbos is like on a Shabbaton, you will have to join us for the next one. Motzei Shabbos was jam packed with amazing Laser Tag games in the snowy woods, football round-robins, a melave malka, mentalist show (he knew you would be reading this) and an outdoor midnight kumzits (a toasty 27 degrees) with smores led ay Rabbi Samuels.